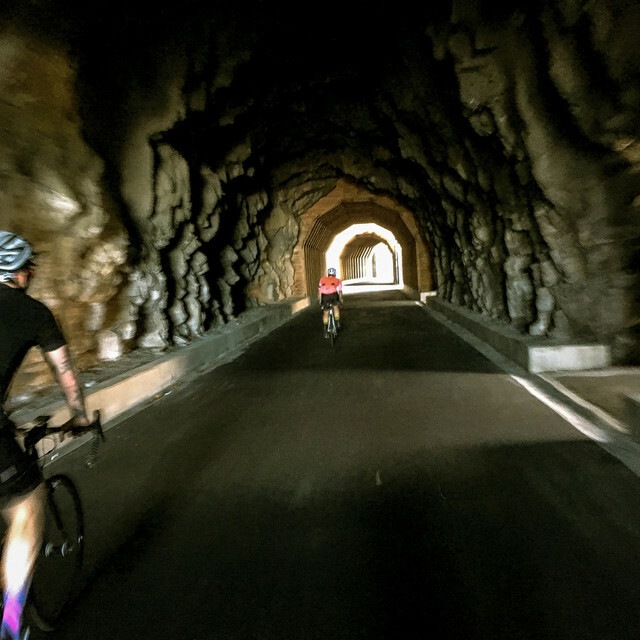 ## THIS FORMIDABLE COLUMBIA RIVER GORGE ROUTE LOOPS THE BEST PAVEMENT OF HOOD RIVER, THE DALLES AND MOSIER INTO A COLOSSAL FIGURE-EIGHT OF EPIC CLIMBS, LEGENDARY DESCENTS AND POSTCARD VIEWS. The Columbia River Gorge is known for many things, the most immediate of which being its designation as a National Scenic Area, acting as the boundary between Washington and Oregon and furnishing the only navigable water route through the Cascades. 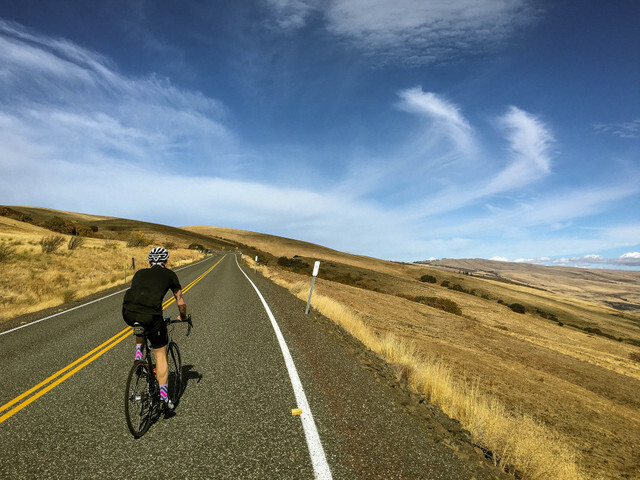 Okay, so that's three things, but if you're reading this you likely already understand that it also contains some of the most reliably spectacular cycling terrain in the Northwest. 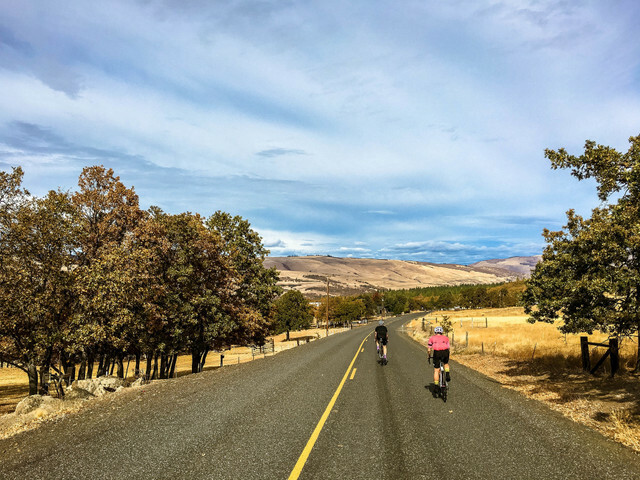 The idea for this particular route was to stitch together some of the best roads connecting Hood River and the Dalles in a paved tour of the unique woodland transition zone connecting the temperate western rain forests and drier eastern grasslands. Things kick off in @point[Hood River](d,92067.89), which as we've mentioned, serves as an ideal staging ground from just about anywhere in town but we prefer to start at [Kickstand Coffee](http://www.kickstandcoffee.net/)/[Dirty Fingers Bikes](http://dirtyfingersbikes.com/) at @point[13th + State](d,92079.44) streets due to the ready availability of good espresso and associated necessaries. The route begins in earnest on highway 30 where it intersects 35 and @slice[begins to climb](d,1632.26,3096.48) the Historic Columbia River Highway s-curve loops eastbound. This eastern section of the Historic Highway will generally see only a tiny fraction of the auto traffic found in '@slice[waterfall alley](d,4062.99,8988.25)'. Going one step further, at mile 2.5 @point[the Hist](d,3875.01)oric Highway is gated prohibiting automobile traffic, climbing east along Gorge's southern rim, through the Mosier Tw@slice[in Tunnels before i](d,9781.96,10025.97)ntersection Rock Creek Road and descending into the town of @point[Mosier](d,79546.71). Pushing west from Mosier, highway 30 begins to pick up elevation, climbing the dry grassy ridges approaching @slice[Rowena Crest](d,17232.47,18023.74). At mile 13.7 things take a turn for the dramatic as the Historic Highway banks a sweeping right and begins to descend the @slice[Rowena Loops](d,20760.07,25433.16), the iconic series of horseshoe curves snaking east below @point[Mayer State Park](d,24662.37). 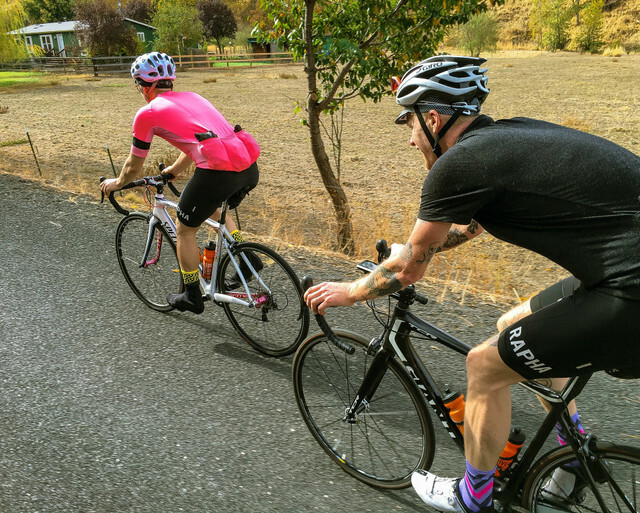 Lean in and savor the array of six buttery smooth, perfectly proportioned horseshoe curves as this is arguably one of the best descents in the Northwest and quite possibly the very reason road bikes exist in the first place. As the descent tapers and the road straightens through Rowena, the @slice[next seven miles feel](d,25927.75,37912.45) like a distinct transition into a much drier region, the asphalt an attenuated ribbon hugging the narrow gradient between the Columbia River and the black basalt of the cliffs towering high above. As @slice[highway 30 drops](d,33980.83,35922.34) into the north end of The Dalles, take a right onto @point[Chenowith Loop Road](d,35959.66) and another right onto West 10th Street as you approach @point[Wahtonka High School](d,59935.69), the staging ground and rollout for the annual Gorge Roubaix road race. W 10th begins to climb gently as it rounds the bend westward, becoming Chenoweth Road. The awkward discrepancy between the 'Chenowith' vs. 'Chenoweth' spellings trace to the cavalier penmanship of Justin Chenoweth, 1850s-era mail carrier between The Dalles and the upper Cascades, whose illegible signature seems to remain a curious point of contention between area residents. For our purposes however, just keep climbing until Chenoweth @slice[dips at mile 25.5](d,41064.76,41281.73) and bank a hard left onto Browns Creek, a sublime stretch of pavement with an easygoing climb through scrubby ranchland and pockets of lodgepole and ponderosa pine. At mile 29, @slice[Browns Creek makes a sweeping loop to the left](d,45930.76,47357.07) and continues climbing, now northeastward, via Cherry Heights Road, rolling along the ridge for the next 4 miles into increasingly cultivated farming areas. 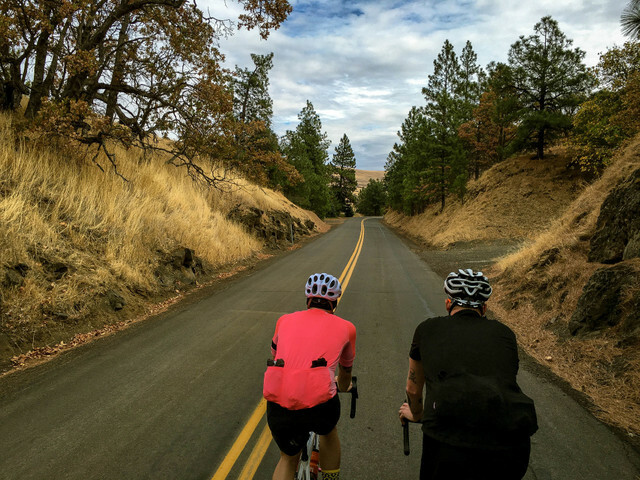 At mile 32.5 @slice[Cherry Heights Road](d,52455.62,56712.91) dives into an epic descent loaded with banked S-curves and sweeping sightlines across the fertile agricultural valley to the southeast. A bit of caution is advised here as this area can be extremely gusty with unexpected sidewinds in spots. As Cherry Heights drops back into The Dalles, take a @point[left back onto West 10th Street](d,56800.37), which skirts the southwest fringe of The Dalles before completing a loop back to @point[Wahtonka High School](d,59988.58). The route proper will continue straight along W 10th, retracing our earlier steps before heading up @slice[Seven Mile Hill](d,60939.66,68178.44), but this may be an opportune moment, particularly in warmer months, to pop back down Chenowith Loop for a quick water top-off, the Home Depot and @point[76 station](d,35961.35) mini-mart being the closest opportunities. Water bottles replenished and back on course, retrace the next half-mile before taking a right up @slice[Seven Mile Hill Road](d,61015.53,68420.29). 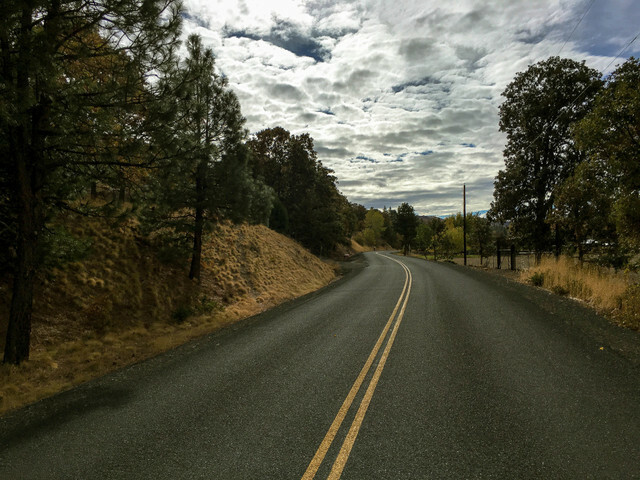 Seven Mile Hill is a tortuous polarizing beast loved by some, cursed by others. Grinding up 1700 feet over seven miles of exposed windblown bluster, Seven Mile Hill offers unbelievable views of the valley and river below. Seven Mile winds, curves, tucks and doubles back on itself less dramatically than Rowena below but in a manner wholly appropriate to the form and scale at hand. The top is much less a crest, summit or object of achievement and more of a rounded windblown hump and a shrug before diving down the west side of @slice[State Road back into Mosier](d,75199.2,79959.55). I'm not going to lie, it's a ridiculously fun six-something mile descent with little-to-no traffic over dreamy pavement. Do not resist the urge to tuck in and stoke-hammer the entire stretch back to Mosier. You'll be glad you did. From Mosier, @slice[follow Highway 30 westbound to the right](d,79479.79,80283.28), beneath the entry to 84 and up Rock Creek Road to the Historic Columbia River Highway State Trail, back through the @slice[Mosier Twin Tunnels](d,82066.53,82467.18), through the Historic Highway westside loops and back into Hood River. Of the myriad options for food and drink upon your return to Hood River, we keep coming back for the Modelo and margaritas at [Hood River Taqueria](http://www.hoodrivertaqueria.com/). Our Mother The Mountain would love your help bringing this route to a wider audience.